I was given the Frank Palma hat along with this dress. The original owner of the dress is now 98 and wore this on her wedding day some 70 years ago. 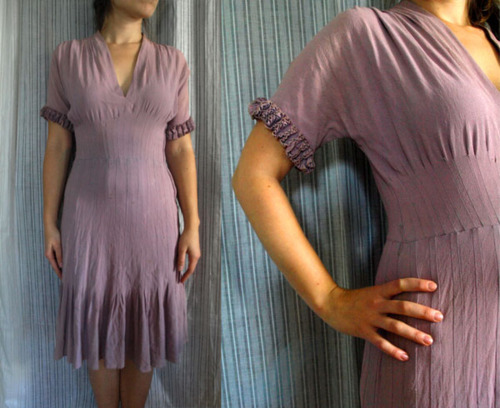 It has some slight yellowing, and some of the pleats are starting to come undone, but I think it’s a beautiful dress. Pretty timeless, in my opinion. The tag inside the dress, like the Frank Palma hat, says it’s a New York Creation, but also has the letter ILGWU, like the label pictured below (found on vintagefashionguild.org, along with some information on the label). ILGWU stands for the International Ladies’ Garment Workers’ Union, and according to Wikepedia, “was once one of the largest labor unions in the United States, one of the first U.S. unions to have a primarily female membership, and a key player in the labor history of the 1920s and 1930s.” Pretty cool.